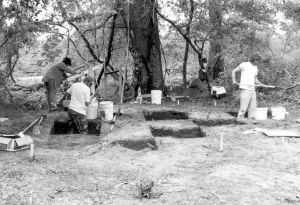 Thousands of Caddo Indian artifacts excavated from a site west of Gilmer in the 1990s are being studied at Stephen F. Austin State University in Nacogdoches. Researchers believe the Caddos lived in what is now Upshur County, between the years of 700 A.D. to the mid-15th century. Crews excavated at several sites, including the Kelsey Creek Dam site and the Rookery Ridge site. Each yielded a variety of items ranging form small fragments of pottery to arrowheads, tools and pipes to whole home and burial sites. 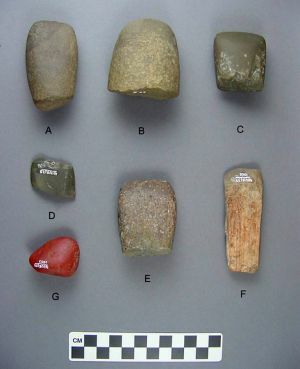 Top: Celts (small axes) from the Rookery Ridge site, with a red pottery polishing stone used for burnishing the surfaces of pots are shown. Above: Engraved pottery, tentatively titled ‘Gilmer Engraved,’ from Rookery Ridge site is seen. The Caddo Indians were potters and made a wide variety of utilitarian wares. An archaeological project begun in Upshur County two decades ago is nearing completion. 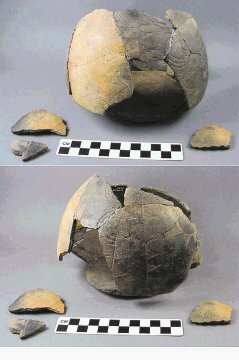 Caddo Indian artifacts excavated from several sites west of Gilmer in the 1990s to make way for Lake Gilmer have been analyzed, photographed and cataloged and are being prepared for display at Stephen F. Austin University in Nacogdoches, the archaeologist in charge of the project said Friday. “There are several tens of thousands of items,” said Mark Parsons, who oversaw the excavations in the reservoir basin. Parsons has been in charge of the project as it was transferred from a private company contracted by the City of Gilmer to the Texas Historical Commission. 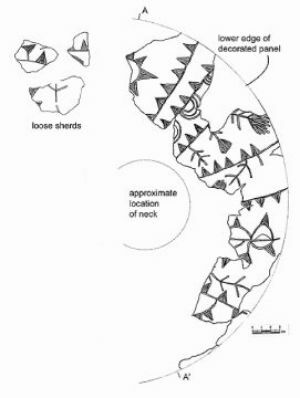 Studying the finds, which range from small fragments of pottery to arrowheads, tools and pipes to house remains and burial sites, Parsons has spent the past 20 years gaining rare insight into the lives of the Caddos who lived in what is now Upshur County, between approximately 700 A.D. and the mid-15th century. “These are pre-Spaniards,” Parsons said. “They were the most advanced pre-historic culture that lived in that area. In some senses they were more advanced than we are. They lived in harmony with the environment. They supported themselves and didn’t worry about the world coming to an end the next day. They had very sophisticated religious beliefs. The Caddos were great potters and they made a wide variety of wares,” he said.